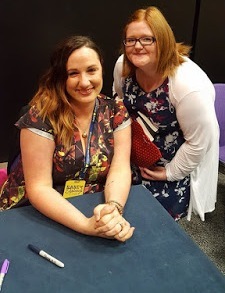 Yesterday Rea from Rea's Reading and Reviews tagged me! This is the first time it's ever happened to me and I think it's sounds quite fun so I'm gona do it. 1. Who is your favourite fairy tale character and why? Beast from Beauty and the Beast because he doesn't think anyone could ever love him because of the way he looks bu Belle shows him he is just as beatiful as she is as beauty comes from the inside. 2. Do you watch a lot of TV? Hmm . . . I do watch sertain programmes all the time but I don't sit in front of it like 24/7 but I do record alot of programmes to watch at night. To write a book and get it published, the thought of seeing my name attached to my work which people can read just makes me so happy. But opening a small book shop is also in there so close . . .
5. Who is your book crush? This is easy!! Beck from The Demon Trappers by Jana Oliver. 6. Love at first sight or a slow burning romance? 9. For valentine’s: roses (as in the flowers), chocolates or a teddy bear? Ohh Yeah! Awesome! Wish one to get whisked of to Turkey in time for my best friends wedding. :) Wish two, To open a small book shop for people to enjoy the world of reading. :) Wish 3 To meet Jana Oliver, C.A Kunz and Jennifer Laurens! 11. If you could make one book required reading for everyone, which book would it be? 1, Who's your favourite Fictional Hottie? 2, What is your favourite book that has made quite an impact on you? 3, What are your top 3 dreams or aspirations? 4, How long have you been blogging for? 5, What's your favourite colour? 6, Who's your favourite Author? 7, Favourite social networking site? 8, If you could meet one author who would it be? 10, Morning Bird or Night Owl? 11, What time it where you are? The 10 blogs below were picked at random through the blos which I follow. :) It's up to you whether you take part, apologies if you feel it's spam. I could only pick 10 as my net kept freezing. I loved reading you answers! I'll work on my post for next week!